With rainfall currently totaling between 15 and 25 inches, Hurricane Harvey, now downgraded to a Tropical Storm, has caused significant damage to parts of Texas and Louisiana. The storm is expected to remain in Southeast Texas for the next several days and could produce additional rainfall amounts of a foot or more. Local residents are encouraged to remain cautious of rising flood waters, downed power lines, road closures and compromised drainage systems. BELFOR CEO, Sheldon Yellen, sits down with CNBC's Squawk Box to discuss how over 30 years of experience in the disaster recovery business has helped him prepare the company to quickly and efficiently respond to catastrophes of this size. BELFOR's National Catastrophe Response Team and hundreds of emergency restoration experts are currently providing regional support to those impacted by this historic storm. With 42 tractor trailers of equipment and supplies on-site, BELFOR's initial emergency services include board-ups, storm damage repairs, water removal, flood cleanup, mold prevention and industrial dehumidification. Once the storm system has dissipated and stabilization increases, additional restoration, decontamination and reconstruction procedures will be addressed to assist these communities through the recovery process. We encourage those affected to follow local authority recommendations and stay mindful of remaining flood dangers. If you are in need of assistance, BELFOR’s Emergency Hotline is available 24/7 at (800) 800-BELFOR. 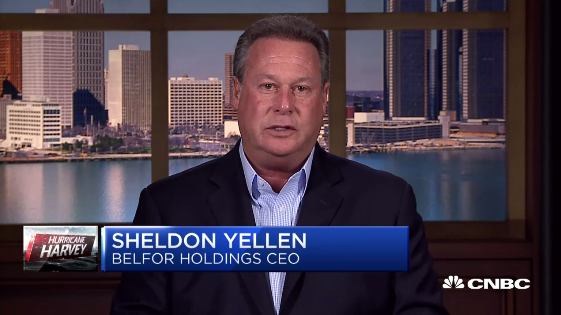 Click here to watch Sheldon Yellen's full interview with CNBC's Squawk Box.